Sharp mentioned OLED once in this press conference, but didn't bother after that – instead CEO and Chair Doug Koshima talked up LCD as the tech that Sharp believes is here to stay for a while yet. "We've seen other technologies emerge like OLED. "While Sharp has been exploring OLED, we have always maintained that LCD remains the best technology for consumers today and in the future," commanded Koshima, in a manner that demonstrated he didn't really want to field questions about it after. "The growth of the LCD TV market today is not what it has been over the last few years," he continued, adding that the industry – like everybody else – had been affected by the global economic downturn. Koshima said the market was expected to fall 16 per cent over the coming year and value was now driving consumers. Therefore, he surmised, somewhat predictably, cheaper LCD products are also important for established markets such as the US and Western Europe. Sharp also talked up its new March 2010 plant in Sakai City – the first on the planet to to use 10th generation glass substrate. That's up to 15 40-inch panels from a single sheet. "We call it a manufacturing complex for the 21st century," enthused Koshima. Sharp will also produce solar panels at the same plant. "We're able to utilise common materials resulting in increased efficiency." Bob Scaglione, Senior VP Product Marketing, reiterated Sharp's continued strength in LCD tech: "While we're extremely proud of our past launches, we're aware of the needs of the mainstream consumer." Scaglione introduced Sharp's line of integrated Blu-ray TVs, the Aquos BD featuring an integrated slot-loading Blu-ray player and a 120Hz panel. Sizes range from 32- to 52-inches. The models also feature haze prevention "to minimise gloss and intensify brightness." The TVs automatically adjust luminance to match room ambiance. The line will be available in the US from next month. 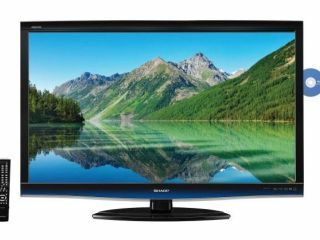 Other models launched include the 5 HDMI port E77U (40-65 inches) and the games console-orientated E67U (32- and 40-inches) with four HDMIs. Sharp also launched new partners for its Aquos Net on-screen internet widget service; Navteq for mapping driving routes and keeping track of traffic plus Rallypoint for sports and social networking. The company also announced two new Profile 2.0 Blu-ray players at quite impressive price points. The BD-HP22U ($299) and BD-HP16U ($279) are also joined by new Home Theater systems with built-in Blu-ray - the 720W BD-MPC40 and BD-MPC30.